For pricing and configuration options please call or email us. 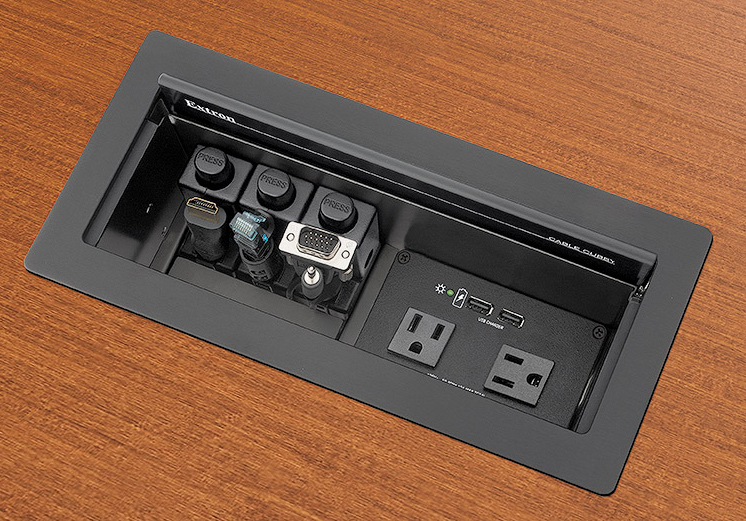 The Extron Cable Cubby® 1202 is a slim, compact furniture-mountable cable access enclosure for AV connectivity and AC power. 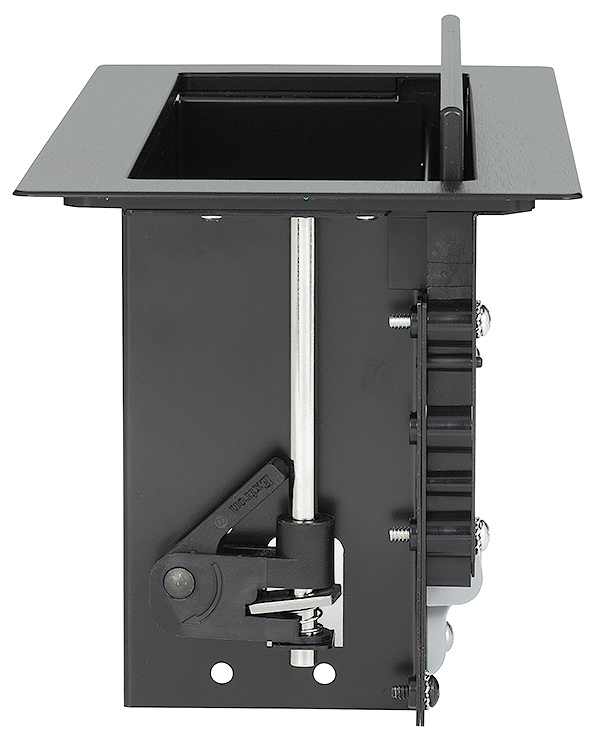 The redesigned enclosure is 2” shorter than the previous model, providing increased under-surface clearance in modular tables, desks, and other furniture. The Cable Cubby 1202 accommodates one Series/2 AC or AC+USB series power module and includes mounting brackets for cable retraction modules, AV cables, or AAP - Architectural Adapter Plates. Cables and AAPs can be installed or serviced from the top of the enclosure. The Cable Cubby 1202 features integrated clamp system that quickly secures the enclosure without additional parts or tools. The power modules are available for the US, Europe, and other major world markets. The Cable Cubby 1202 is available in a black anodized or brushed aluminum finish. The Cable Cubby 1202 is equipped with a number of Extron-exclusive, integration friendly features for fast assembly and installation. The integrated clamp system quickly secures the enclosure to the furniture surface without tools. Simply install the enclosure in the opening, slide the clamp up to the surface, and then rotate the cam to lock the enclosure in place. A lid damper ensures smooth, quiet operation that complements installations in high end conference rooms and board rooms. The enclosure's shortened height beneath the table is ideal for semi-permanent folding tables in modular spaces. The Cable Cubby 1202 includes standard connectivity brackets for mounting up to three Retractor modules, three AAPs, or up to eight AV cables. The AV connectivity brackets can be positioned to the left or right of the selected AC power module. 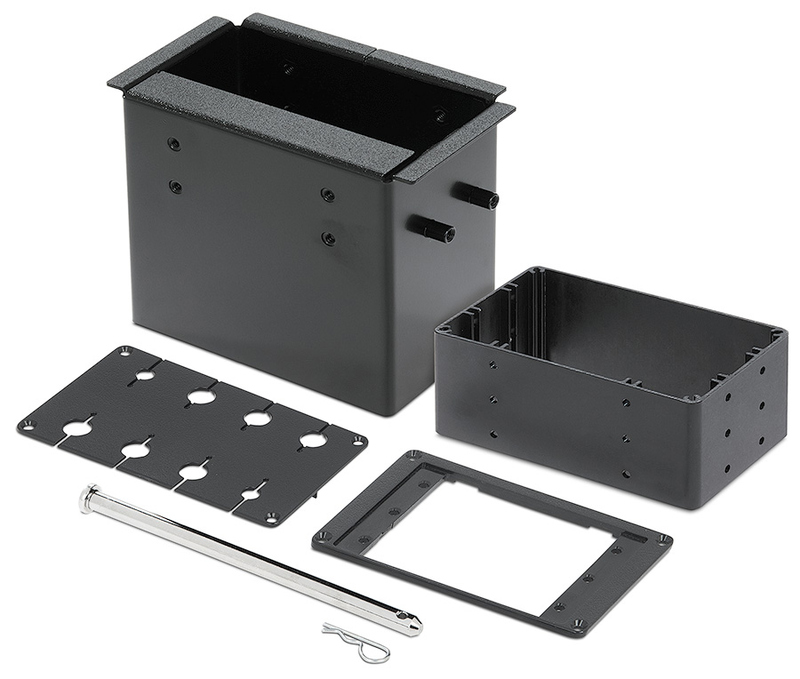 For design flexibility, the optional Cable Bracket Kit and Retractor Bracket Kit allow AV cables or Retractors to be mounted to the left and right of the selected AC power module. The brackets are sold in pairs; each bracket supports four AV cables or two Retractor modules. The enclosure's patented modular design allows cables and AAPs to be installed or serviced from the top of the enclosure after it is installed. The Cable Pass-Through Bracket features a unique, split-ring design that facilitates cable installation while eliminating the need for separate cable grommets. AC Power Modules are available for the US, Europe, and other major world markets. Most AC 100 Series AC Power Modules provide two unswitched AC outlets. An available Multi-Region AC outlet is compatible with a variety of AC plug types. 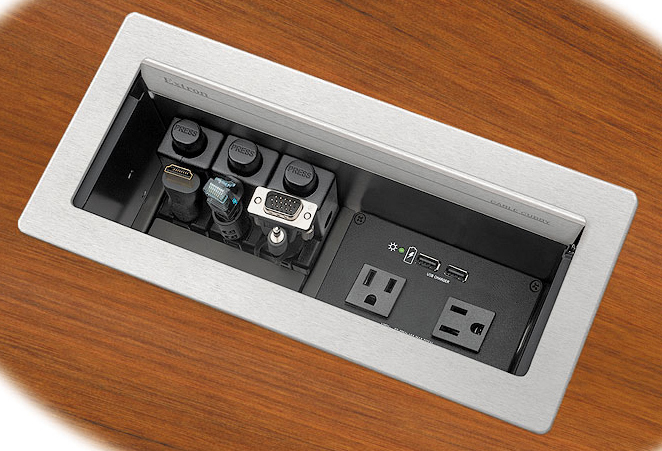 To support the growing use of smartphones and tablets in AV presentation environments, the optional AC 200 Series AC+USB Power Modules provide one or two AC power outlets, and two 5 VDC USB power outlets with 2.1 A / 10.5 watts of total power for charging mobile devices such as smartphones and tablets. Cable Cubby Series/2 enclosures are UL/c‐UL listed and CE compliant. Installation routing templates and other accessories are also available. To quickly customize AC power and AV connectivity selections for a Cable Cubby 1202 installation, the Cable Cubby Series/2 Builder is an interactive tool that guides the user through the selection of AC power modules, AV connectivity, cables, and installation accessories. As you build your Cable Cubby, a bill of materials is prepared automatically. When you're finished, the Builder allows you to review your Cable Cubby and make any last minute changes before placing your order (dealer login required). New Slim enclosure is 2” (51 mm) shorter than previous model, making it ideal for conference tables, desks, lecterns, and other work areas where space is at a premium - The low profile is ideal for semi-permanent folding tables in modular spaces. Patented modular design for fast assembly and serviceability - AV connectivity can be installed or serviced from the top of the enclosure after it is installed. AC power and AC+USB power modules are available for US, Europe, and other major world markets - Most AC power modules provide two unswitched AC outlets. AC+USB power modules provide one or two AC outlets and two USB power outlets. Integrated side clamps secure enclosure to the furniture surface - Cable Cubby can be secured in place without additional parts or tools. Low-profile lid and full-width cable pass-through for convenient access to AV and power - Integrated damper provides smooth, quiet operation. Cable Cubby Builder is available at www.extron.com/cablecubbybuilder - Intuitive online tool for enclosure selection, pricing, and cable and connectivity selection.